I took a break from painting to create some dungeon tiles. One of the recurring questions that appears on the Two Hour Wargame Forum is “what’s the difference between 2 Hour Dungeon Crawl and the dungeons in Talomir Tales” or “Warrior Heroes Legends” or “Warrior Heroes Armies & Adventures?” That’s right, there’s four games from THW that have dungeon crawling in the rules. So, I thought I’d do a blog post on the features of each one. But before I can do a post on the various dungeons, I discovered I needed more dungeon tiles. 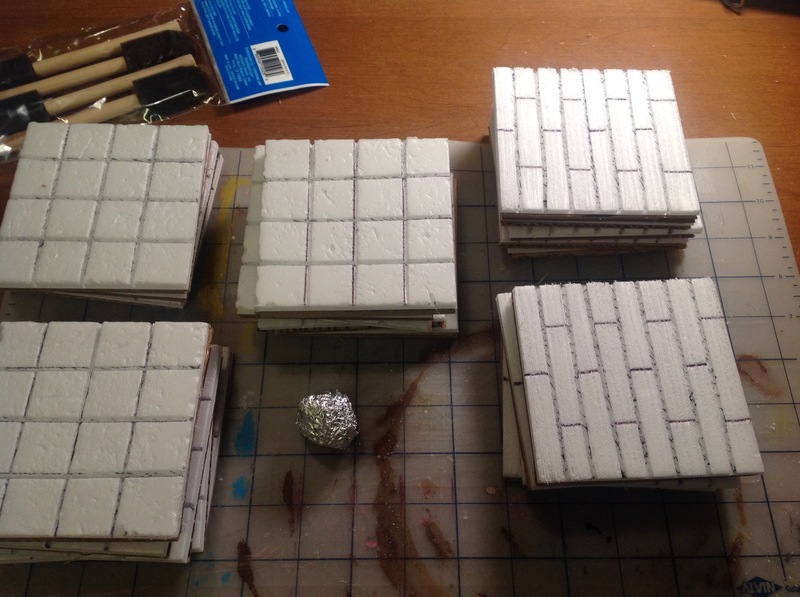 Commercially available dungeon tiles can be a little costly and part of the definition of a “Floozy” includes the word “cheap”, so I searched the Internet and found quite a few YouTube channels which specialize in building terrain for tabletop games. The three that inspired me so much that I became subscribers are Wyloch’s Armory, Black Magic Craft and Dungeon Craft. 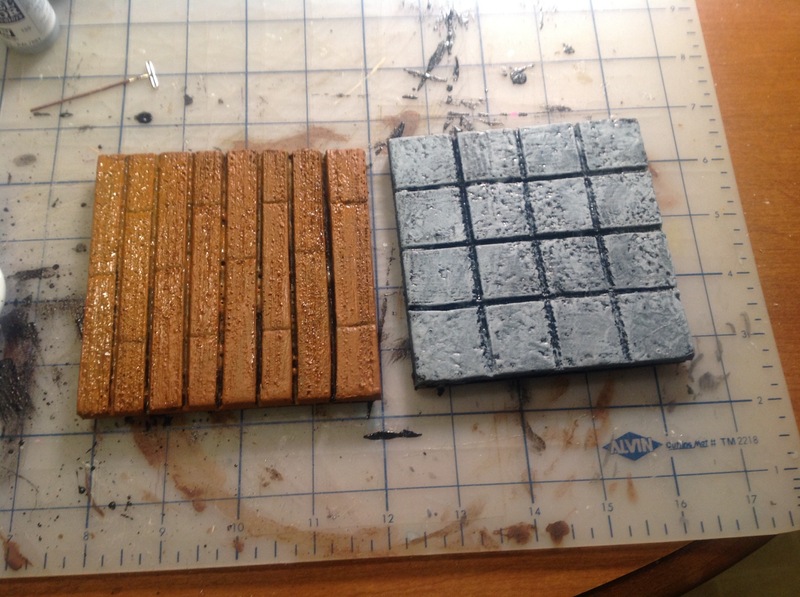 All three have videos on making dungeon tiles and they really helped me make mine. I had all of the materials on hand except for one, “dollar store” foam core board. I have plenty of foam core board – but all of the videos said to specifically get foam core from a “dollar store” and the reason is simple – you can easily peel the paper off of one side. So, I went to the Dollar Tree near my house and spent a dollar for a sheet of foam core board. The first step was to cut up a corrugated cardboard box into 24 4″ squares. 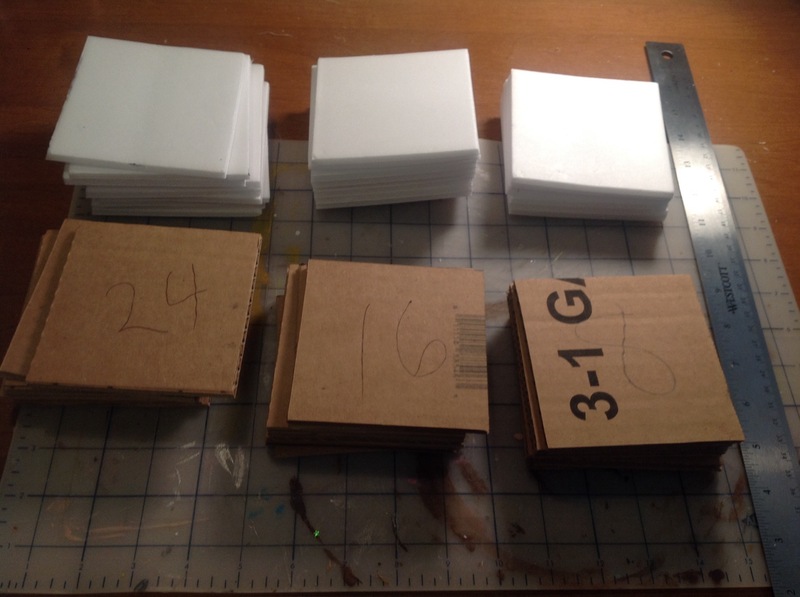 I then cut 24 4″ squares out of the sheet of the foam core board, about 2/3rds of the sheet. I peeled the paper off of one side. The second step was to break out my hot glue gun and glue the foam core to the cardboard squares. 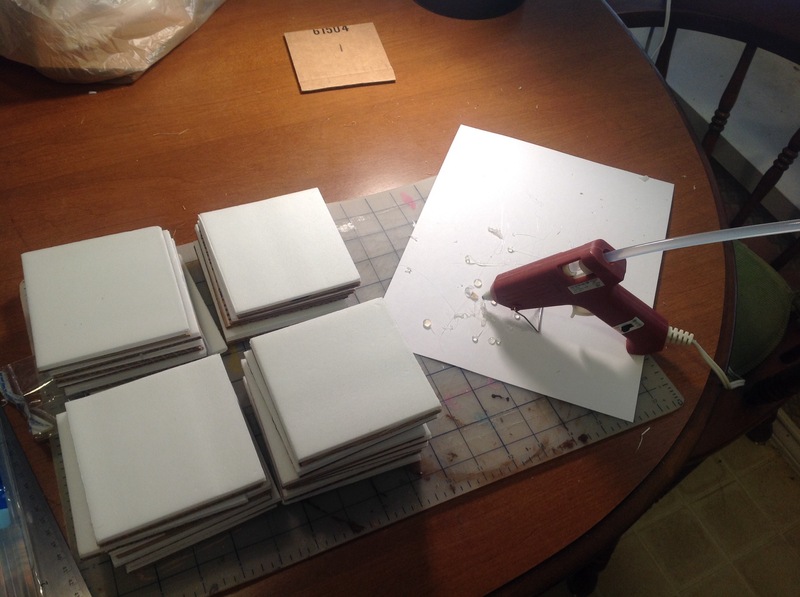 You want to use a glue that has very little water content to prevent any warping – that’s why I used the hot glue gun instead of white craft glue. Be sure to apply glue to the foam core side that still has the paper. I decided that I needed 2 kinds of tiles – stone tiles and wooden floor tiles. My thought for the wooden floor tiles was to make 9 of them to use as a 12″ x 12″ battle board for a tavern or saloon and the remaining 15 tiles would be used for dungeons, castles, etc. I used a ball point pen and ruler to score the stone tiles into 1″ squares and the wood tiles into planks 1/2″ wide. To add texture, I used a wire brush to make the wood grain and a crumpled ball of aluminum foil to create a stone texture. After I finished adding texture, I sealed each tile, front and back, with a coat of Modge Podge mixed with black paint. 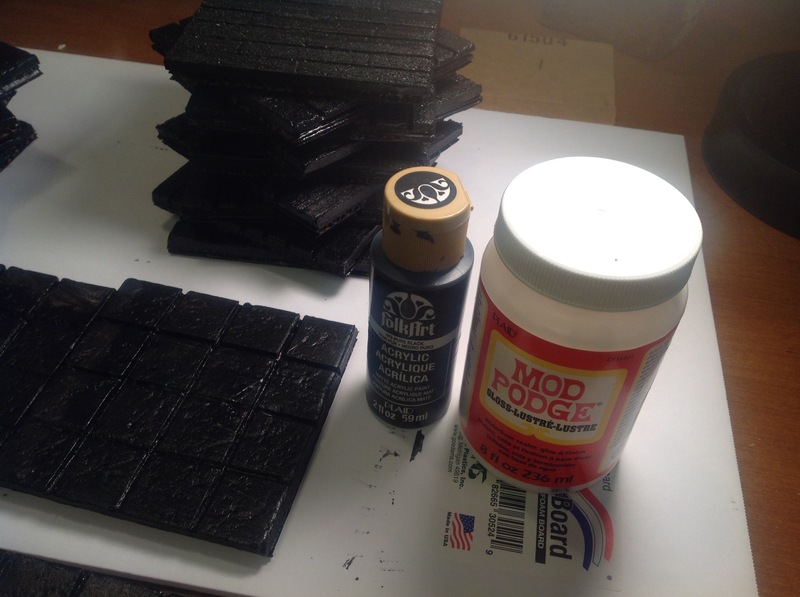 I used Modge Podge instead of white glue because Modge Podge has much much less water content and includes sealers – it was designed for decoupage. You have give this plenty of time to dry – overnight in my case. And the final chore is to paint the tiles. Painting is easy – for the wooden floor paint it a medium to light brown (I used Raw Sienna) and finish with a brown wash and for the stone floor dry brush a dark gray, then dry brush a medium gray and a final dry brush of a nearly white light gray. Seal with a matte varnish and you’re done. Looks simple and effective. For some reason I’ve never taken the leap to make dungeon tiles. Simple, cheap, and effective. Should not be hard to make larger, or more unusual tiles either.